One Body of Water is a 45 minute-long performance that intertwines the stories of three contested rivers of the Americas: the Magdalena (Colombia), Yaqui (Mexico), and Elwha (Washington, US) rivers. 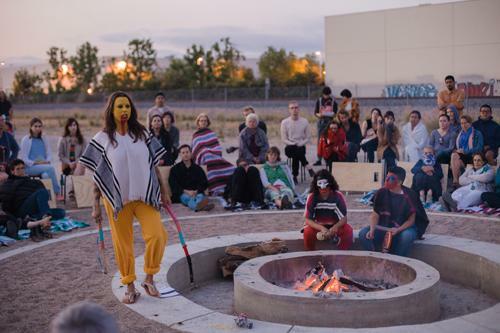 Resonating with indigenous oral traditions, the performers embody the voice of the rivers, inviting us to shift the way we think about nature, and how we interact with non-human bodies. For tonight’s Beyond 2° exhibition opening Caycedo will do a performative reading of three excerpts from the One Body of Water script. Carolina Caycedo (b. 1978, lives in Los Angeles, CA) has participated in numerous international biennials, including Berlin (2014), Havana (2009), Whitney (2006), Venice (2003) and Istanbul (2001). In 2012, Caycedo was a DAAD Artist-in-Berlin resident. She has received grants amongst others from Prince Claus Foundation, Art Matters, Harpo Foundation and Creative Capital.